UAE leaders attended the official celebration of the 47th National Day on Sunday evening at the Zayed Sport City in Abu Dhabi, reported Emirates News Agency Wam. Held under the theme 'This is Zayed. This is the UAE', the event saw the attendance of Their Highnesses Supreme Council Members and Rulers Dr Sheikh Sultan bin Mohammed Al Qasimi of Sharjah, Sheikh Humaid bin Rashid Al Nuaimi of Ajman, Sheikh Hamad bin Mohammed Al Sharqi of Fujairah, Sheikh Saud bin Rashid Al Mualla of Umm Al Quwain, and Sheikh Saud bin Saqr Al Qasimi of Ras Al Khaimah. Their Highnesses the Supreme Council members and Rulers of the Emirates, Crown Princes and Deputy Rulers, extended greetings to President His Highness Sheikh Khalifa bin Zayed Al Nahyan on the occasion, praying Allah Almighty to grant him good health and keep him for his nation and people so as to pursue the comprehensive development process and lead the country towards more building, progress and prosperity. 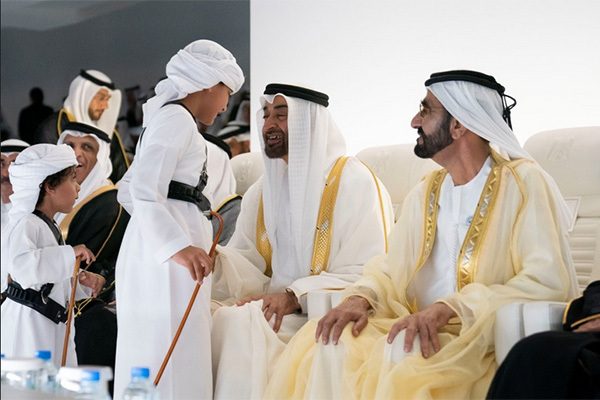 The celebration, attended by over 22,000 people, opened with a tribute to the rich legacy of the late Sheikh Zayed bin Sultan Al Nahyan, marking 100 years since his birth. The event also saw rare photos, chronicling Sheikh Zayed's life, his love to the nature and the people, displayed for the first time. The event also highlighted poems written by the late Sheikh Zayed bin Sultan Al Nahyan and other poems. One of the poems, written by the late Mohammed bin Hamm, a long time companion of the UAE Founding Father, in which he referred to how Sheikh Zayed looked like his grandfather Zayed the First and how he inherited from him the leadership qualities. Also highlighted was Sheikh Zayed's relations with his late mother Sheikha Salama bint Butti and how she helped shape his strong personality and his wisdom. Ahmed Khalifa Al Suwaidi, the President's Representative, who was also UAE's first Foreign Minister, recalled his time with Sheikh Zayed. The audience reacted vigorously when audio recordings of the late Sheikh Zayed bin Sultan Al Nahyan speeches were played. As the National Anthem played, a panoramic human map of the UAE federation map, as envisaged by Sheikh Zayed and the other founding fathers, was formed by 300 of the UAE Armed Forces personnel. The event closed with footage of the late Sheikh Zayed addressing his people and a tweet by His Highness Sheikh Mohammed bin Rashid Al Maktoum, Vice President, Prime Minister and Ruler of Dubai, using the hashtag: #zayed_taught_me, calling on the citizens and residents to express what values they have learnt from Zayed. The hashtag will remain open to the public to express their love for the late Sheikh Zayed bin Sultan Al Nahyan, bring the 'Year of Zayed into a worthy culmination.